Stacks II (No Base) is the BOTTOM burner of the Stacks configuration. The great thing about the Stacks concept is that you can buy the torch now and get the base later, for only $58. Buying the setup in stages offers you the flexibility to have your torch grow as your artistic needs expand. Stacks II has 16 GAS jets and 48 OXYGEN ports. Face diameter is 1". At FULL FLAME it consumes GAS: 4 lpm (240 lph) and OXYGEN: 20 lpm (1200 lph). 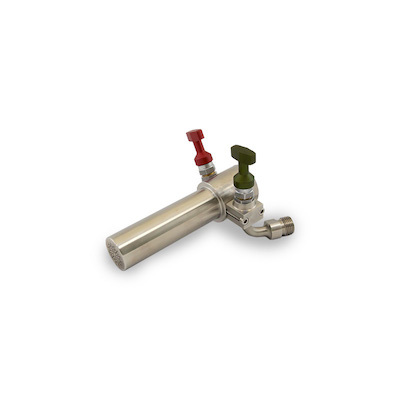 Constructed primarily of stainless steel and is equipped with modular needle valves. Each burner comes with B-fittings. Works great at low pressures with oxygen concentrators. Comes with a Lifetime Factory Warranty!